Walt: put ourselves into the text. We are learning to write a text and put ourselves into the text. We are doing are poster about a product and our reading. We have learnt to make a poster like an advertisement poster. What we tried to do was to make a poster but like a real one that people put up for other products. My product is a cup of hot Koko(coco). 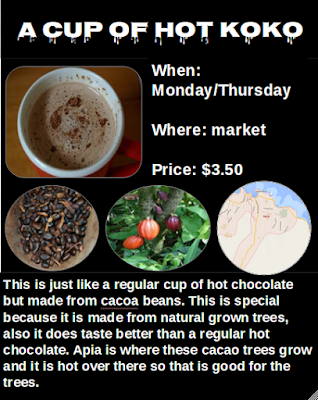 The task asked us to make a poster and put a picture and a paragraph also information about what product we are going to do.